The Veterans Wall of Honor is located at Mile 35.5 Parks Hwy., next to the Visitor Center. The summer unofficially kicks off with a long holiday weekend, but don&apos;t forget about the reason of the day off - Memorial Day, a time when we honor and pay tribute to those who have given the ultimate sacrifice in the line of service. The Mat-Su Valley has a very large veteran&apos;s population, and hosts several veterans&apos; events each year. Two popular veterans memorials are erected at opposite ends of the Susitna Valley, and both are popular among visitors with ties to the military. 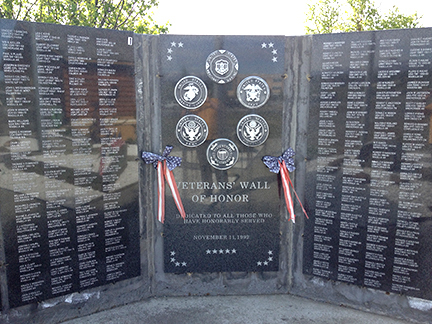 The Veterans Wall of Honor stands alongside the Mat-Su Visitor Information Center at Mile 35.5 Parks Highway, in front of the hospital. This memorial was dedicated on Veterans Day, 1992, after an impressive amount of work and dedication from local veterans to secure funding from the governor of Alaska and the Mat-Su Borough. On the wall, names of service members are inscribed, serving as a lasting tribute. The panels also provide visitors with gorgeous views of Pioneer Peak and the Chugach Mountains. On Monday, Memorial Day festivities take place at the Veterans Wall of Honor beginning at 1 p.m.
Further north on the Parks Highway, at Byers Lake in Denali State Park (Mile 147 Parks Hwy. 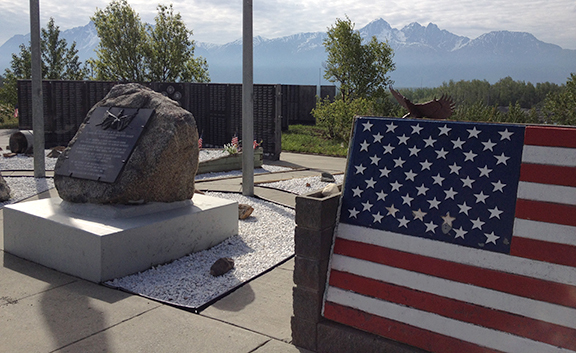 ), the Alaska Veterans Memorial is located. The memorial honors all branches of the military, as well as specific Alaskans who were awarded the Medal of Honor. There are also tributes to the passengers and crew of military plane crashes in Alaska. The memorial was erected in 1983, and then-Gov. Bill Sheffield dedicated the site in 1984. This weekend, get out and enjoy the outdoors, fire up the barbecue and have a safe and memorable holiday. But don&apos;t forget the reason for the extended weekend, and take a moment to thank a veteran and remember those who gave the ultimate sacrifice in the line of duty.